In December 1778, through the influence of Colonel Richard Henderson and Nathaniel Hart, the Virginia House of Delegates granted to the Richard Henderson (Transylvania) Company, 200,000 acres of land in Kentucky situated between the Ohio and Green Rivers. In 1783, the North Carolina legislature granted the same to the company. 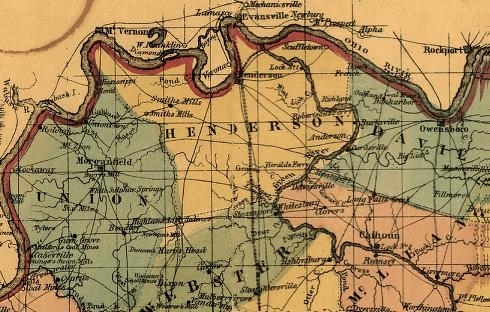 The result being that Henderson County was formed out of part Christian County and was organized on June 4, 1799. Named in honor of Colonel Richard Henderson, one of the original founders of Kentucky, the county initially encompassed all of the territory from which the present Hopkins County was formed in 1806. Union County was formed in 1811, and Webster County was formed in 1860. The county seat of Henderson was incorporated in 1810. Today the population of Henderson County is 44,829 and covers 440 square miles. The city of Henderson boasts over 27,000 of the population and sits high above the river on a bluff. Henderson is home to the John James Audubon State Park, Ellis Park Race Track and a 1,000 seat fine arts center. Each year Hendersonians sponsor the Big Rivers Arts and Crafts show, Lions Club Tri-Fest, W. C. Handy Blues & Barbeque Festival and Bluegrass Music Festival. Website created and maintained by Netta Mullin and Leigh Ann Boucher as members and in cooperation with the Henderson County Historical & Genealogical Society. Please excuse any delays in updating information, errors and web content. This page was last updated Tuesday, 21-Jul-2015 06:08:20 MST . You are the visitor since July 19th, 2002. No part of this website may be reproduced in any form without written permission from it's submitter, owner, publisher and moderator.